Bound by the Blues is exactly what the title implies. Landreth doesn’t take any measures to redefine the material, and aside from his explosive playing, it pretty much hews to a traditional template. A native of Lafayette, Louisiana, Sonny Landreth is no stranger to the blues. An esteemed slide guitarist, he’s loaned his services to any number of iconic outfits, from Clifton Chenier’s legendary Red Hot Louisiana Band to side stints with both John Mayall and John Hiatt. His adopted nickname, “The King of Slydeco”, reflects his roots in the big bayou, but the accolades accorded him by his peers -- Eric Clapton in particular -- elevates his stature considerably. Not to worry. We don’t intend on quizzing you on that later. Indeed, for the less technically astute among us, the proof is in the playing, and Landreth’s latest, appropriately titled Bound by the Blues provides a case in point. Touted in the press materials as a return to his roots, it finds him covering several familiar standards along with an equal number of lesser known tunes. It’s especially significant given that his last few albums -- specifically, the fusion-esque Elemental Journey and the star-studded From the Beach -- took him further afield. Indeed, it marks his first album of pure blues since 2003’s Grammy nominated disc The Road We’re On. That said, Bound by the Blues is, well, exactly what the title implies. Landreth doesn’t take any measures to redefine the material, and aside from his explosive playing, it pretty much hews to a traditional template. The sense of déjà vu is inescapable, thanks to the fact that many of these tracks -- “It Hurts Me Too”, “Key to the Highway” and “Dust My Broom” -- have been covered quite frequently by nearly every guitarist who ever expressed a desire to fully bask in the blues. Nevertheless, the blues is an indefatigable formula, and any player as riveting and resourceful as Landreth is clearly capable of applying his or her personal imprint on the material. Hence, the ferocious bottleneck playing on “Walkin’ Blues”, “Cherry Ball Blues” and “Firebird Blues” (dedicated appropriately to the memory of late great Johnny Winter) adds a zest and deliberation that charges these songs with renewed urgency and intensity. The same can be said of “Dust My Broom”, one of the most venerable songs of the set, and one which still benefits from Landreth’s relentless, rocking treatment. 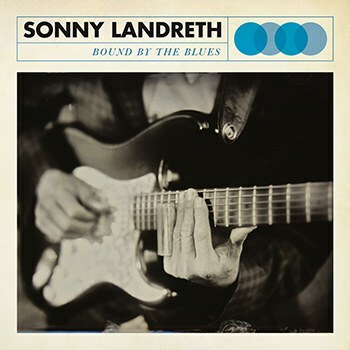 Whether considered a basic blues primer or simply another example of Landreth’s deftness and dexterity, Bound by the Blues provides a clear connection to an essential musical form. Here again, Landreth’s incendiary sound effectively elevates it all.